Melograno (Pomegranate) was launched by Santa Maria Novella in 1965, and has become one of the brand's most popular fragrances. Melograno was a puzzle to me for some time as the aroma bears little resemblance to the juicy red fruit it is named for. Instead, Melograno is an aldehydic, powdery musk aroma that invites comparison to scents like Chanel no. 22 and Santa Maria Novella's own Muschio Oro. An uncomplicated fragrance, Melograno’s unisex composition remains a mystery. Opening with a sharp blast of aldehyde, moving to a middle-note that smells like a combination of gold musk and pencil-eraser (yes, pencil-eraser), and drying down with a hint of leather, Melograno is easily one of the most distinctive colognes I’ve experienced. Having been compared by fellow reviewers to everything from vintage shaving products to hairspray, this is definitely a scent that needs to be experienced to be understood. To my nose, Melograno shares quite a bit in common with Guerlain’s Habit Rouge and Dana’s Canoe, sharing Canoe’s sweet overall character and somewhat mossy basenotes while nodding to Habit Rouge’s carnation, leather and citrus accords. Combine these two with Chanel no. 22 and voila! Melograno. 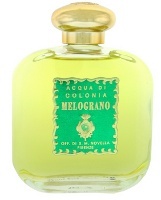 Melograno’s longevity is better than most of Santa Maria Novella’s other colognes, perhaps due to the inclusion of aldehydes and musk, and its sillage is surprisingly powerful. A love it or hate it scent, Melograno is perhaps the perfect answer to those looking for something slightly more avant garde than the standard Acqua di Colonia fresh citrus fare. Melograno is $84 for a 100 ml cologne splash. For buying information, see the listing for Santa Maria Novella under Perfume Houses. Related reading: reviews of Santa Maria Novella Melograno home fragrance and scented body products. Habit Rouge?? Clearly my skin chemistry clashed with Melograno in the worst way possible. It was a sweet, super-powdery mess on my skin, an instant scrubber. Interesting. I love Habit Rouge despite the fact that Tony Blair wears it. I've been resisting a visit to the London SMN store but I feel I can't resist much longer. ever when I visited the SMN boutique in Florence over 16 years ago. Cannot see any similarity with Habit Rouge though (which has been a staple for my DH for years). Must resniff this again. Have to chime in & say I don't get Habit Rouge either. Marlen & I should have done a “he says/she says” on this one! I’m afraid Marlen no longer writes here so he won’t be along to answer you…personally I don’t remember incense (just soapy powder) in Melograno, but it’s been years since I smelled it! No, I really don’t, but this one stuck out — interesting scent that did not remind me of pomegranates in the least. Never did decide if I liked it or not. It is not my sort of thing either, but many people adore it!